Alistair Whyte, head of residential property at Coodes (centre) receives Excellence in Conveyancing Award from Victor Freeney of award sponsors Thames Water Property Searches and Law Society President Lucy-Scott-Moncrieff. The residential property team of south west law firm Coodes Solicitors has won a national award for the quality of its work. Alistair Whyte (centre) receives Excellence in Conveyancing Award from Victor Freeney of award sponsors Thames Water Property Searches and Law Society President Lucy-Scott-Moncrieff. 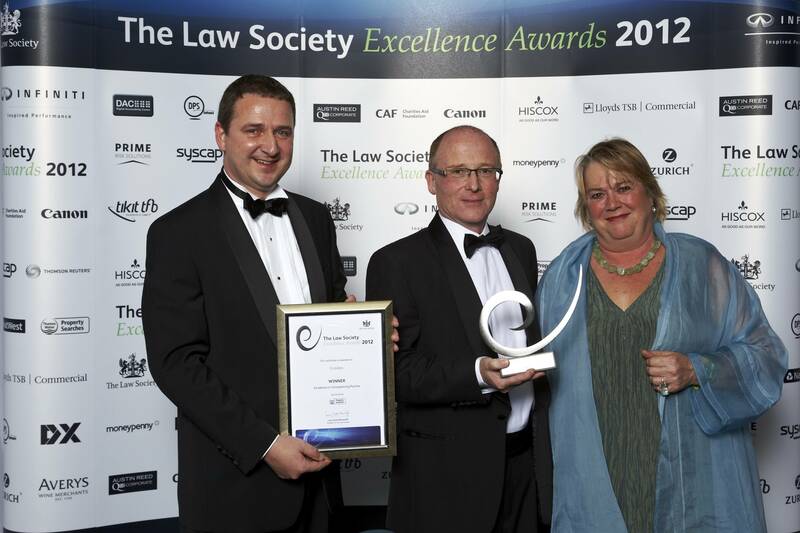 The team, led by partner Alistair Whyte, was awarded the Excellence in Conveyancing Award at the Law Society’s Excellence Awards 2012. It was the first year for this award category, and Coodes was up against legal firms from all over the UK. More than 600 legal professionals attended the event, which recognised best practice, excellence and outstanding achievement across England and Wales. The awards also highlighted innovative business practices, successful approaches to practice management as well as contributions through social responsibility and equality and diversity initiatives. Coodes was one of the first firms in the south west to achieve the Law Society’s Conveyancing Quality Standard scheme, and it was Coodes’ work in championing this new standard which led to the award win.